Zimbabwe's Sevens rugby team upstaged pre-tournament favourites Kenya 17-5 in the final of the Africa Men's Sevens to be crowned new continental champions in Monastir, Tunisia on Sunday. The Cheetahs produced one of their finest performances in recent years against the higher ranked Kenyans who are regular participants on the HSBC World Sevens Series to win their first African title since 2012 and third overall since 2000. In the battle of unbeaten sides prior to the game, Zimbabwe went ahead after five minutes with a converted try from Shingirai Katsvere despite being a man down from a yellow card to one of their players Tarisai Mugariri. Kenya, who were tipped to comfortably clinch the winner-takes-all final responded with an unconverted try at the stroke of half time through a Brian Wahinya after an interchange of passes with Cyprian Kuto to head to the break trailing 7-5. 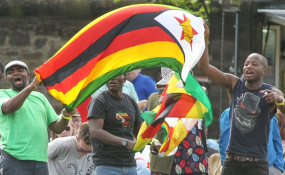 Zimbabwe, buoyed a the solid defence and speedy backs, were nevertheless always in control and soon stretched their lead early into the second half. Speedster Tafadzwa Chitokwindo outsprinted the Kenyan defence before releasing Takudzwa Kumadiro for the Cheetahs second try that was unconverted. The Germany-based Chitokwindo, who only met up with his teammates in Dubai enroute to Tunisia, was to add the third try with a minute and a half left on the clock to lock the game. It was sweet revenge for the Cheetahs, who in 2015 missed out on a place at the 2016 Olympic Games in Rio de Janeiro, Brazil, after conceding a last gasp try to the Kenyans, having led 17-14 with seconds left on the clock. The Cheetahs who were runners up at the Africa Cup in 2017 after losing 10-7 to host nation Uganda went into the final day unbeaten on the back of comfortable wins over Mauritius (34-0) and hosts Tunisia (26-5) in the pool stages of the 12-team tournament on Saturday. On the final day on Sunday, the Cheetahs comfortably beat Senegal 19-0 in the semis early before overcoming a 19-0 half time deficit to knockout the 2016 and 2018 champions Uganda after a 24-19 extra time victory. Zimbabwe's victory means they will participate in the Dubai, Cape Town and Hong Kong legs of the 2018-2019 HSBC World Rugby Sevens Series.